Question: When is a “distilled” spirit not really a distilled spirit? Answer: When it’s actually a high-ABV, fermented wine, posing as a popular style of distilled liquor to trick consumers into buying it! Look. Let me begin by saying yeah, I get it that I’m not the target demographic for the array of fake liquors I’m about to discuss in detail. You don’t need to point this out. If you’re reading this, then you most likely aren’t the target demo either. Let’s be honest: The typical Paste reader is more likely to be a collector of rare beer and scotch than they are a frequent consumer of 99-cent gas station mystery liquor bottles. But that doesn’t mean we can’t still be equal parts angry and bemused at the sheer charlatanism of what is going on here—or at the very least, disgusted to see such a brazen attempt at tricking the implied target demographic, which is the poor and the homeless. It’s not like the existence of “bum wine” is a new phenomenon, but at least the likes of Mad Dog 20/20 or Thunderbird don’t PRETEND to be something they aren’t. It’s the disguises—the putting on of airs—here that are so heinous. So let’s get to the point: We are talking about a range—I’d say a “brand,” but they don’t have an overarching brand name—of products made by the same company that can now be found in many gas station and convenience stores, which are disguised with the aesthetic trappings of common, popular liquor styles. 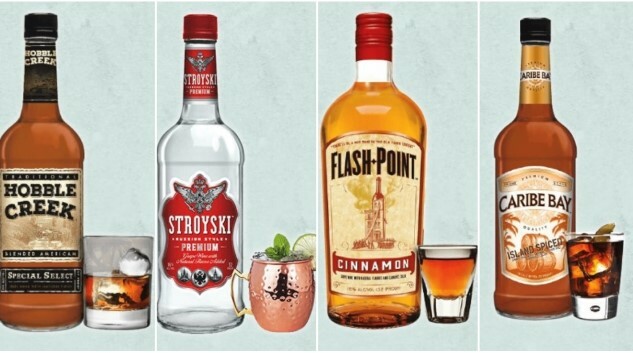 There’s “Stroyski,” which looks just like a Polish or Russian vodka. There’s “Old Westbury,” which looks like a dapper, London-style dry gin. There’s “Hobble Creek,” which borrows the rugged iconography of bourbon. There’s “Vera Cruz,” which puts an agave plant on its front label, but is most definitely not tequila. None are actually distilled spirits at all. Who could possibly mistake them for spirits while reading a description like this, which uses the word “vodka” three times and manages to leave the letter T out of the word “sought”? Instead, this entire range of products are what is apparently known in industry parlance as “fermented spirits.” They’re strong, fortified wines that are produced with “natural flavors” in order to emulate whatever style of liquor they’re pretending to be. Each bottle contains the words “grape wine with natural flavor added” in the small print, for the sake of legal necessity. And they’re made (brewed?) to the maximum strength that can be sold in gas stations/convenience stores in various states. At least two different strengths exist: 16 percent ABV bottles found in the Carolinas, and 21 percent ABV bottles (which I sampled myself, I’m sad to say) found throughout Georgia. The full range of distribution is difficult to ascertain, given that information about these brands is very scarce online, but they’re also sold in Florida at the very least, and probably in numerous other states. When found at 21 percent ABV, that makes them considerably more potent than even the typical likes of Mad Dog, Night Train, Thunderbird or Cisco. Here’s one Florida distributorship’s rather hilarious definition of the “fermented spirits” segment, which highlights its value to the consumer as the convenience of not having to make a separate trip to the liquor store in order to obtain terrible booze. Fermented spirits are those alcoholic beverages that reach up to 42 proof (21% ABV) and are available for purchase in grocery/convenience stores in addition to bars and restaurants. These products are produced in a manner similar to spirits, but the alcohol they contain is from grape fermentation rather than distillation. For retailers, this means that fermented spirits can be sold without a full liquor license. For consumers, this means that the flavor of national brands of alcohol will be available in grocery and convenience stores without a separate trip to the liquor store. Gee, thanks for the time-saver, guys. Why stop at the package store to pick up a bottle of Knob Creek when I can just grab some 21 percent ABV Hobble Creek whiskey-flavored wine, a product whose very name makes it sound like it will leave me with a permanent limp? That’s not an insane substitute at all. I’m sure it makes a great Manhattan. After all, they apparently use it “in bars and restaurants,” presumably of the highest caliber. There’s our answer, right? Well, not so fast. Do a little Googling, and you quickly see that there’s no distillery in Maine by that name, or at least none with a public face. There is a company named Boston Brands of Maine that operates a bottling plant (and apparently does some distilling) in Lewiston, Maine, though, and THEIR parent company is Sazerac Co. Which is to say: Sazerac Co., one of the two largest spirits companies in the U.S., is where the buck stops here. “Brookstone Distilling Co.” is simply a phantom name that I can only assume was designed to move the product one step further away from anyone having to take ownership of it. Oddly enough, Buffalo Trace (also owned by Sazerac) also has a subsidiary by the name of The Brookstone Distilling Co., with address listed as Frankfort, KY—where Buffalo Trace is also based. This made me wonder for a fleeting moment if the liquid in bottles of “Stroyski” and “Vera Cruz” could possibly be made by Buffalo Trace in Kentucky, so I reached out to Sazerac directly to allow them to comment on these 99-cent gas station bottles. By way of background, these type of alternative beverages are not new, they have actually been on the market for 40+ years. Consumers are increasingly seeking out a variety of different beverages and packages in non-traditional retail outlets; spiked seltzers, craft beers, canned wines, ciders, wine and malt-based coolers have also been enjoying a resurgence. Our products are made to the highest quality standards using proprietary wine recipes as the statement of content on the label shows and also explains the variety of outlets in which they are sold. They can be enjoyed neat plus they also make a fantastic array of mixed drinks including screwdrivers, bloody Mary, with tonic, margaritas, colada, and with Coke. Their low alcohol content is in keeping with the promotion of moderate consumption and calorie control. These products are produced and bottled at our Lewiston, Maine facility. The Brookstone Distilling Company is one of our DBAs at our Lewiston plant. It is fairly common to have several DBA’s [which means “Doing Business As”] under one facility. In answer to your question about if a distillery can produce these products, the answer is yes, but the correct terminology would be to say it is “produced,” in this case, produced at our plant in Lewiston, Maine. The bottom line is that I could forgive a lot of this, if only the packaging for these products (and their marketing descriptions) didn’t try so hard to be inherently deceptive. But they do—across the board, terms like “vodka,” “gin,” “whiskey” and “tequila” are used in the description and marketing of these bottles that are none of those things. Total Wine has Stroyski in the vodka section, and describes it as vodka. So does the Sazerac brand portfolio online. In fact, the Sazerac brand portfolio website straight-up calls Old Westbury “gin,” Vera Cruz “tequila” and Caribe Bay “rum.” There’s no other word for this than lying. That’s just what it is. Sazerac’s attempted defense is to simply point at the fine print of the label and claim that its discerning clientele clearly wants to buy vodka-flavored wine, but that doesn’t mean we have to believe them. If “vodka-flavored wine” was a big selling point, it would be in bold type, not fine print. Finally, please enjoy this Carolina distributorship that is clearly so confused by what the hell these products are that they think the line of bottles are simply called “Sazerac.” We’re sure this is exactly the kind of advertising Sazerac Co. wants associated with their name. And of course, because this is Paste, we had to go out and actually taste the damn things in order to know exactly how bad they really are. In a handful of Georgian gas stations I was able to find six varieties meant to replicate vodka, gin, spiced rum, tequila, bourbon and cinnamon whiskey. Online research suggests there are at least a handful more of these brands, which are meant to emulate brandy, triple sec (? ), white rum and (GAG) Irish cream liqueur. Dear god, I’m glad I didn’t find THAT one. “Irish cream wine cocktail”? Get behind me, Satan! Oh, and by the way … they MISSPELLED THE NAME OF THE PRODUCT IN LARGE PRINT. “Delcan’s,” my god. How could this possibly get any sadder? I present them below, in order of best to worst—because determining the worst here is obviously more fun and interesting than picking the “best.” I invite you to count the copious misspellings we unearth on this journey together, which should be a fun and educational little game for the kids at home. Nestled under the bluffs in England’s Wlishire [sic] County is the small market town of Old Westbury. Old Westbury Extra Dry is a drink crafted in homage to the rich character of the English. Embodies English botanicals and strong Juniper notes. Perfect in any cocktail. So, it’s inspired by an unrelated, misspelled county (it’s “Wiltshire”) in England, is crafted in homage to the “rich character” of the English people themselves, and “embodies” (which is a nice way to say “does not necessarily contain”) English botanicals. Sounds about right. All of these fermented spirit descriptions are laid out in this very precise (but constantly misspelled) legalese, no doubt designed to protect them from claims of false advertising. On the nose, Old Westbury actually smells pretty approachable—light pine, and sweet lemon-lime soda. It’s not too far off from actual gin, to be honest, or at least a “New Western”-style gin like New Amsterdam. On the palate, it’s quite soda-like, with heavy lime candy flavor, like a green Lifesaver. Fairly mild and neutral otherwise, it’s lightly sweet but quite watery in texture (which was universal in all of these). Booze is minimal, especially compared to the others in this tasting. Pine and light floral notes round out what was by far the best of these bottles. Compared with the rest, this one is royalty. I expect that if you told someone it was REALLY cheap gin, they might actually believe you, except for the texture being all wrong. But buckle up, because it gets a lot worse from here on out. Because I assume you want proof of my gas station fake liquor harvest, here you go. No drink is more closely associated with Russia than vodka (translated from a Russian word meaning “little water”). Since it was first produced in Russia back in the mid-fifteenth century, vodka has become one of the most commonly consumed spirits in the world. Much of vodka’s popularity is due to its neutral flavor, making it the perfect addition to any cocktail. We have sough [sic] to capture this classic characteristic with Stroyski. Mix and match in your favorite drink and raise a glass with friends. Cheers! My first thought (and note) was that Caribe Bay smells like “molasses cookies dipped in rubbing alcohol.” Intense, fake caramel flavoring and vanilla extract notes dominate the nose, which is more than a little concerning. On the palate, you get intense molasses flavor but a very watery texture, which is a bizarre combination I’ve never experienced before. Vanilla extract and brown sugar sweetness are present in abundance, in what is a very one-note profile. They don’t exactly go well with the ribbon of medicinal alcohol notes in the background, but this one is still better than a few of the other strongly flavored bottles. Having been around nearly as long as the country itself, American whiskey has deep roots in both the history and culture of the United States. Whiskey’s popularity caught on fast in 18th Century America, and it quickly became the nation’s most popular libation. Hobble Creek’s carefully blended formula was influenced by some of the earliest American whiskey recipes, giving it the smooth, unmistakable taste that Americans first fell in love with all those years ago. For a drink as true as the red, white, and blue, there’s no beating Hobble Creek. Ed note: No misspellings in this one! Congrats! So, Hobble Creek is “influenced” by “some of the earliest American whiskey recipes,” eh? I had no idea that Americans were making whiskey-flavored grape wines in the 18th century. Truly, you learn something every day in this job. Named after a small town in the state of Jalisco, tequila is a Mexican staple that has been enjoyed around the world for generations. Its origins, stretch back even further to the old days of pre-Columbian Mexico, when indigenous people consumed alcohol fermented from the agave plant. The beverage has undergone many changes since then, but tequila’s distinct flavor has been central to Mexican culture for over a thousand years. Vera Cruz Reserva Especial embodies the unique taste that made tequila famous, and the essence of old Mexico itself. “The beverage has undergone many changes since then” … but none bigger than removing anything to do with distillation and replacing it with agave-flavored wine, right? I think we can all agree that’s a bold choice, in keeping with the spirit of old Mexico, sí? At first, I thought Vera Cruz might not be so bad, even though anyone in their right mind would be afraid of tequila-flavored wine. This one is pretty mild on the nose, smelling only faintly of ethanol and a hint of pine needles. On the palate though—yikes. Harsh booziness meets vegetal strangeness in a meeting of flavors that certainly won’t remind anyone of agave. It’s so many strange flavors at once—grassy, almost minty, bitter and overwhelmingly boozy. As I wrote at one point in my notes, “this is BAD bad.” It also highlights one of the weirdest things about these bottles: You can simultaneously TASTE a lot of unpleasant ethanol flavors, but the ABV (at 21 percent) is low enough that you don’t get the traditional alcohol heat/burn of liquor. You’re getting only the most unpleasant aspect of the ethanol, which is its raw flavor. I love how this title just stops after “Cinnamon,” as if it’s rude of you to inquire any further. It’s like the beginning of a “Who’s on First” routine. You can just feel the contents of this bottle inviting you—nay, compelling you—onward to dark deeds, can’t you? The description makes it sound like the launching pad for 1,000 police reports. Thankfully, I don’t really see how that could be true, because I can’t fathom who would be able to stand more than a sip of Flash Point, much less drink enough to become intoxicated. On the nose, I began to write down that it smells like a stick of Big Red gum, when I realized that the more accurate comparison was that it smells very much like the “cinnamon potpourri” waft you catch emanating from the cinnamon brooms in Hobby Lobby every fall. Not offensive, perhaps, but have you ever actually been tempted to eat one of those brooms? Yeah, I thought so. On the palate, it just tastes like liquified, fiery hot cinnamon candies, mixed with a fall Yankee Candle. Being someone who already has no interest in Fireball Cinnamon Whisky, that description obviously wasn’t ever going to entice me. It’s overpoweringly flavorful—stronger in flavors and alcohol/spice heat by orders of magnitude compared to all the rest of these 99-cent bottles. It is, suffice to say, bad, which I think sums things up nicely, considering I’ve just about used up the rest of my descriptive language. Alright, what did we learn? Well, we learned that Sazerac Co. manufactures these quasi-liquors in Maine. We learned that they are not distilled OR brewed, but “produced.” We learned that they most definitely are not actual spirits. We learned that they’re produced to be however strong state law will allow them to be in your state. We learned that this doesn’t stop Sazerac, its distributors, or alcohol vendors like Total Wine from shamelessly implying them to be spirits anyway. We learned that nobody bothered to proofread any of the product descriptions, and none of the distributorships or sites that posted those descriptions bothered to correct the mistakes, either. So with that said: Can we just discontinue these things and regain the slightest shred of dignity in the process? That would be great. Jim Vorel is a Paste staff writer and resident alcohol geek. You can follow him on Twitter for more drink writing.